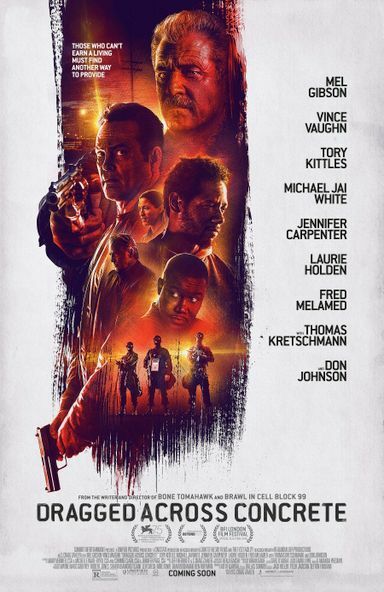 Mel Gibson and Vince Vaughn team up in Dragged Across Concrete, the latest from director S. Craig Zahler. Complimenting 13-film Cronenberg retrospective, Beyond Fest completes its biggest line up with 24 West Coast Premieres including Halloween, Bad Times at the El Royale and SO many more. Bone Tomahawk director S. Craig Zahler takes on Dragged Across Concrete about two cops accused of abusing their power on the force. A stolid, old guard policeman, Ridgeman (Gibson) and his volatile younger partner, Anthony (Vaughn), find themselves suspended when a video of their strong-arming tactics become the media's special du jour. Low on cash and with no other options, these two embittered soldiers descend into the criminal underworld to gain their just due, but instead find far more than they wanted awaiting them in the shadows.